The video we’ve been working on has just been released. 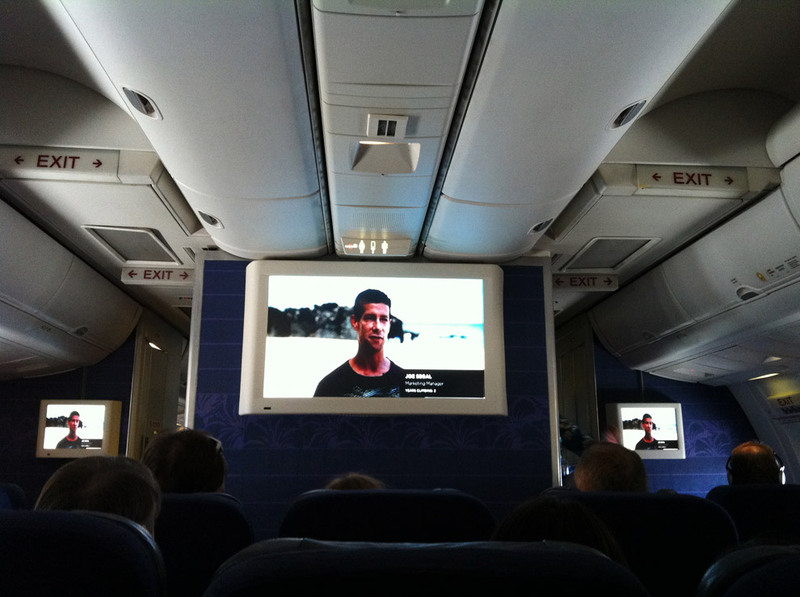 At the beginning of February, it began playing on all Hawaiian Airlines flights to and from the mainland. 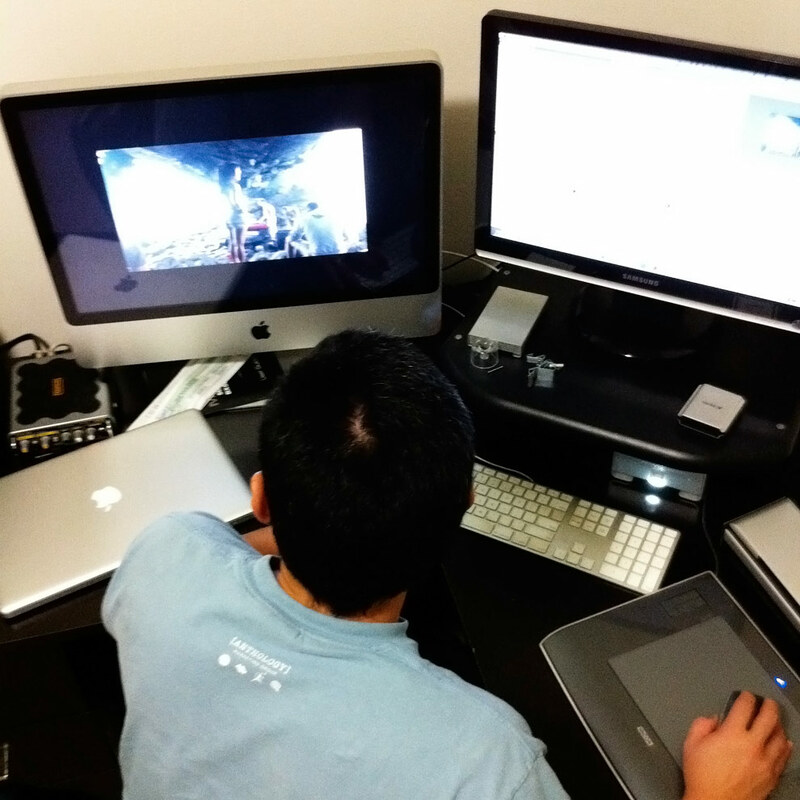 We shot at five locations and spent many late nights editing. 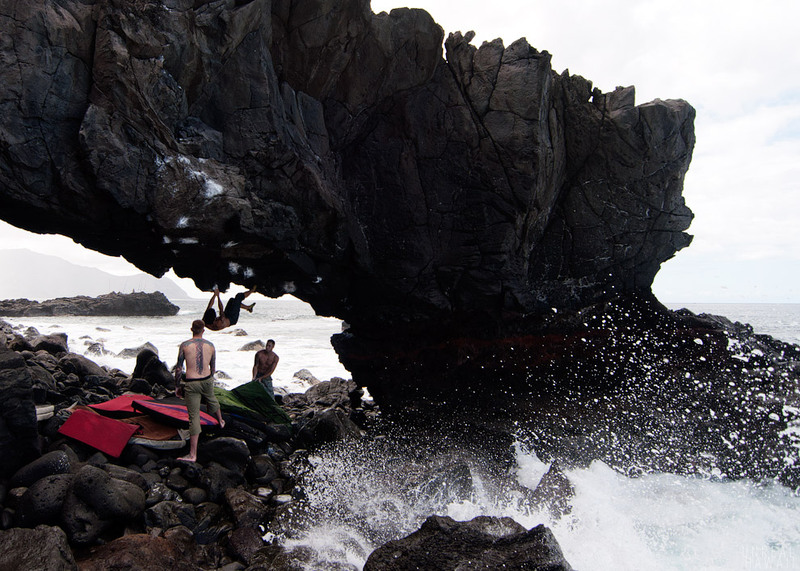 “Hawaii Bouldering” – A documentary-style video about the sport of bouldering in Hawaii. 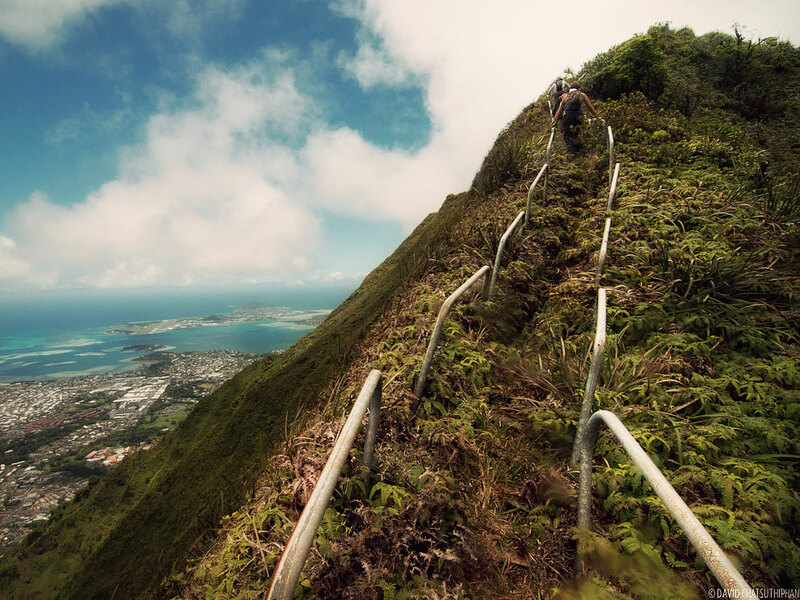 A Berad Studio production for Hawaiian Airlines. The project started with a conversation between me and my friend Brad Watanabe. 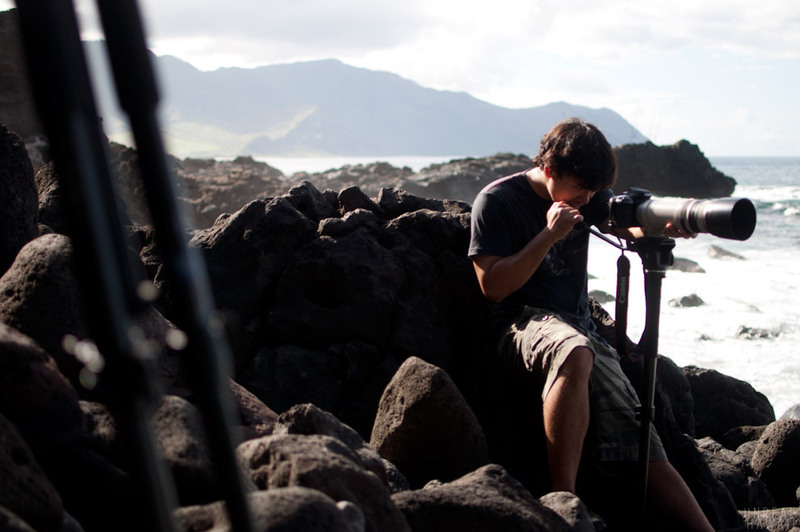 He runs a video production company here in Hawaii called Berad Studio and was interested in producing a video about rock climbing for Hawaiian Skies, the in-flight video magazine for Hawaiian Airlines. 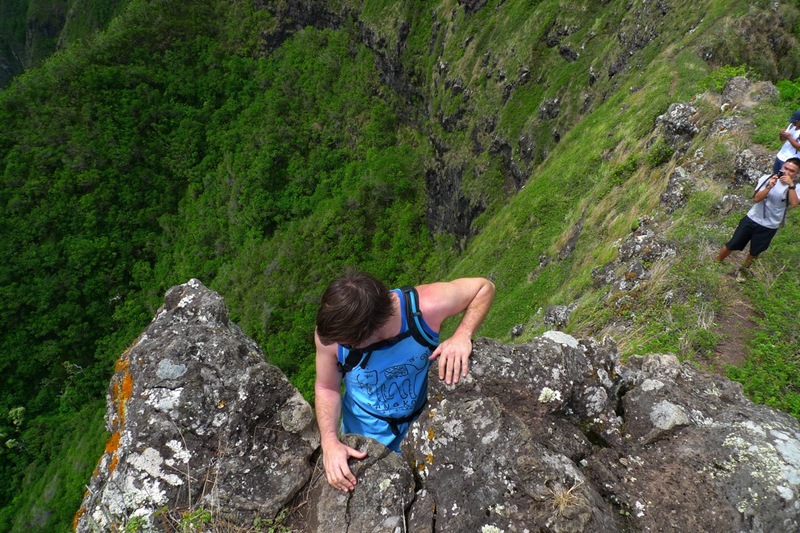 The goal of the video would be to introduce bouldering to a non-climber audience and to showcase the beauty of Hawaii through this niche sport. Brad pitched the project and got the green light. Now, all we had to do was figure out how to get this thing done. 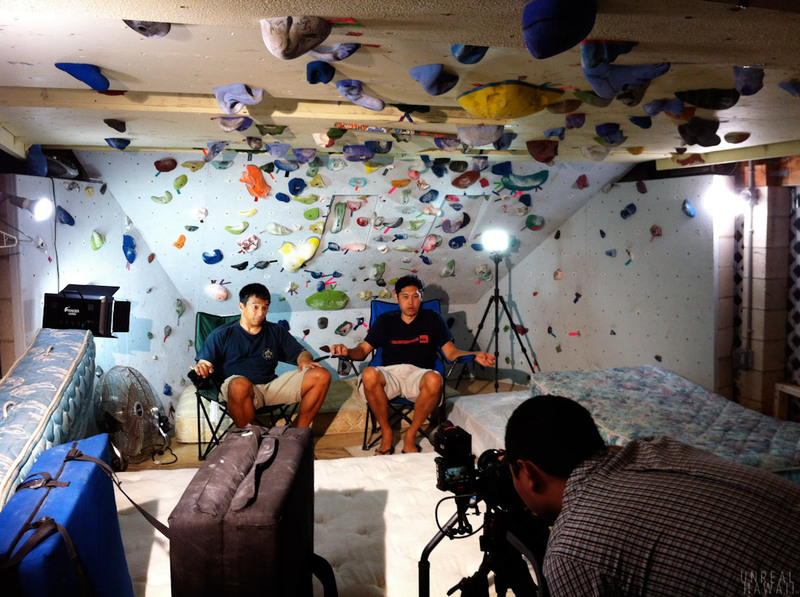 It would be the first real video project I’ve ever worked on and Brad’s first video about rock climbing. My role was to help produce the video (meaning getting all the climbers together and coordinating shoot dates) and serve as the creative director (which meant I helped developed the look of the piece, the flow of content, and feel of the video). The budget for this video was super tight so I didn’t get paid for any of this. But, I figured it would be a fun project to work on. We learned a lot during the production of this piece and there are a ton of things that we wish we could have done differently. But overall, we’re happy with the video. If you’re interested how the video was made, I’ve posted photos from the different shoots with notes on how the project came together. The project started with some long meetings at coffee shops and on my lanai. 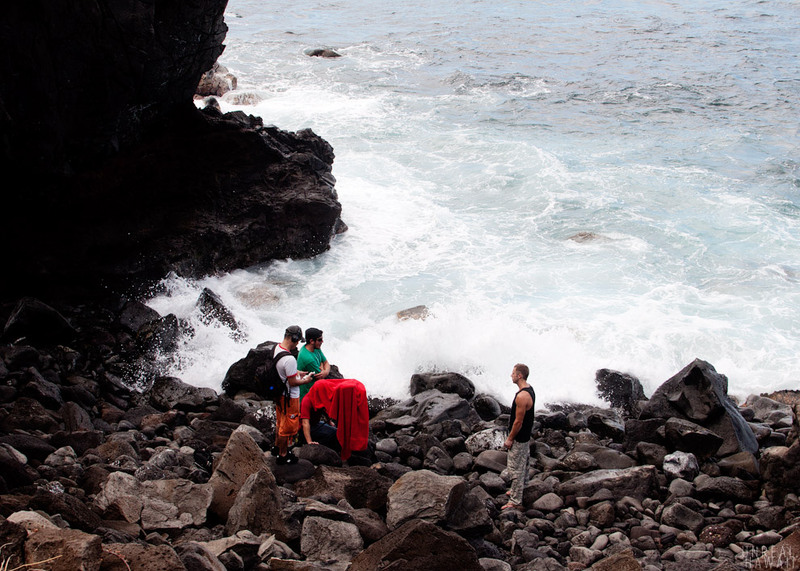 We had to figure out which bouldering locations to shoot at and how we would tell the story of bouldering in Hawaii. Our first shoot was at the Town Boulders. We came out here with Justin Ridgely (owner of Volcanic Rock Gym) to get what we thought would be test-footage since this was Brad’s first time filming a rock climber. But Brad ended up getting some great shots and put together a one-minute montage that we used towards the beginning of the video. 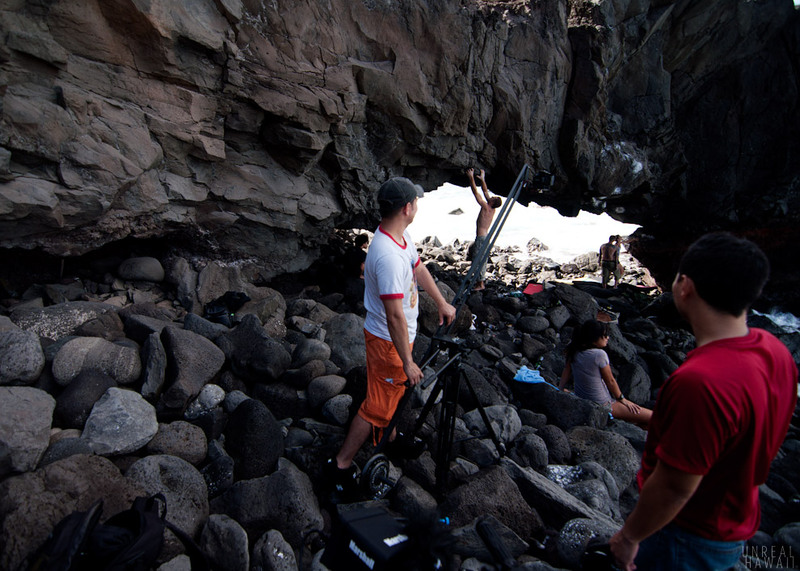 Our second shoot was at the Arch, near Kaena Point. It was the most complex of all the shoots. 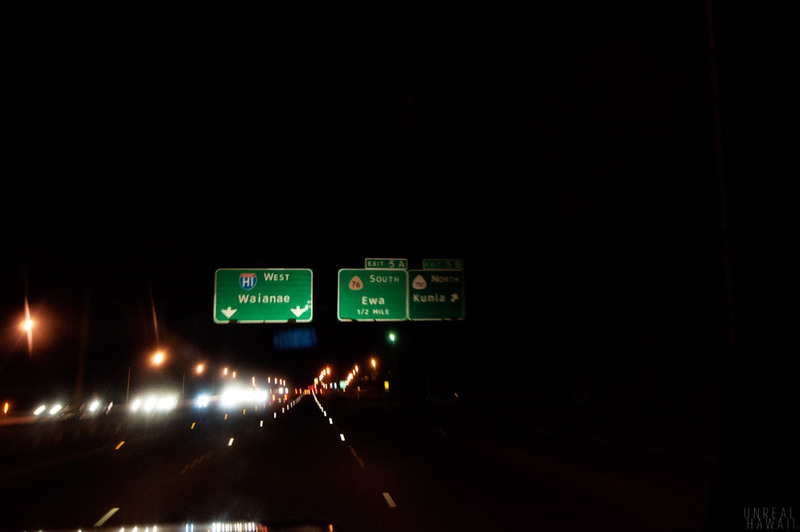 We drove out to the Leeward side of Oahu in the dark. 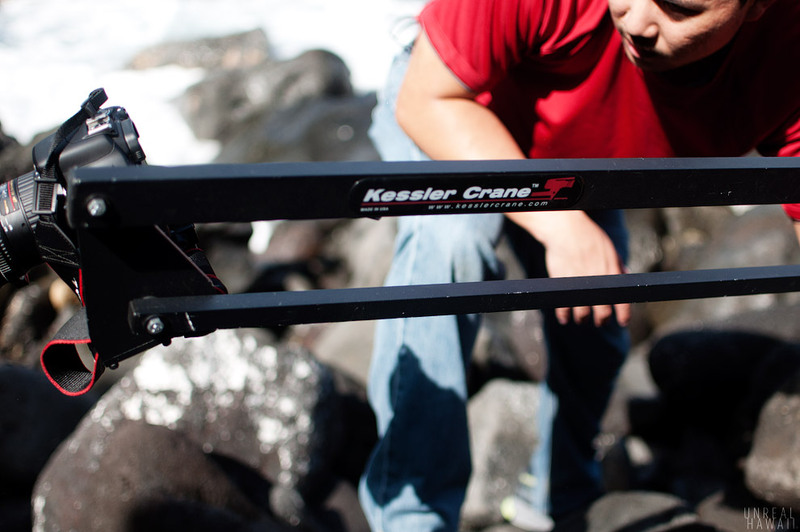 Brad brought out a jib (the long crane looking thing) and a slider to get some nice smooth pan shots. He also brought on two more shooters, Gerad Gilmore and Jon Rhoades, to make sure we could capture three angles at the same time. Being that this was his first time at the Arch, Brad had to scout the place to see where he could set up cameras. 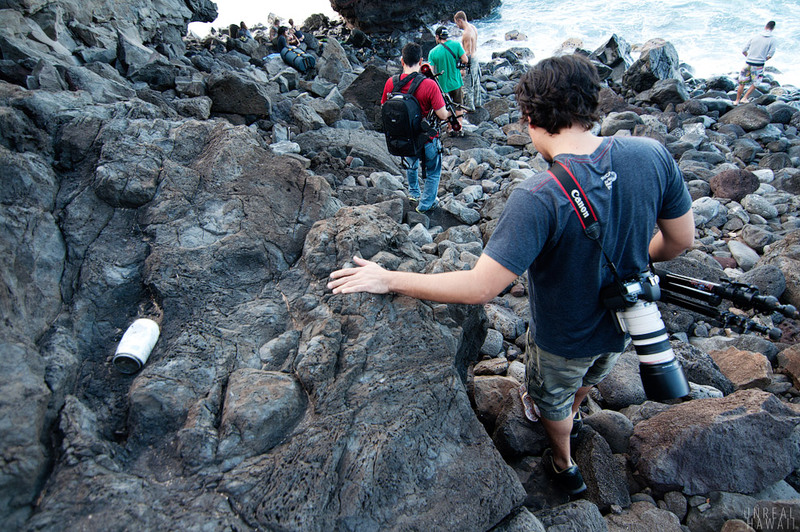 This is not easy terrain to set up a tripod on. 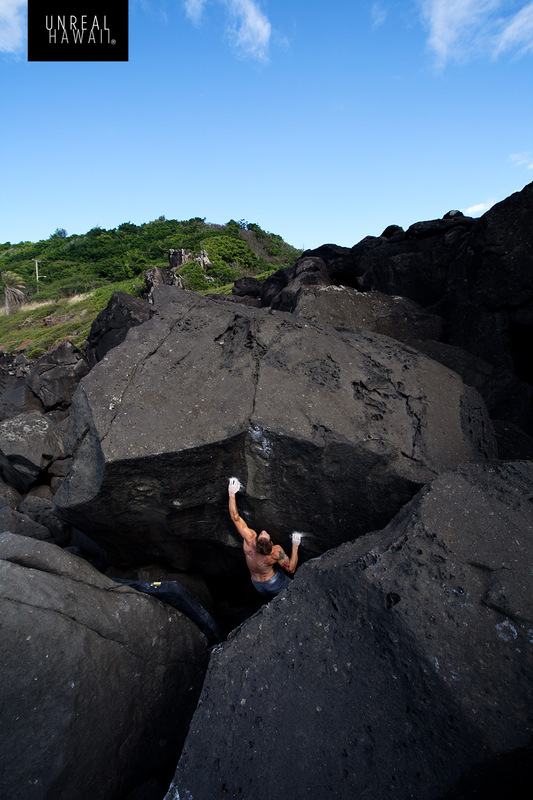 Justin, Hiro Watanabe and Dennis Shaffer were the climbers on this shoot. Jon manned the telephoto lens. It was his job to get close up shots while the guys climbed the Arch. They brought out a few GoPro cameras as well. This one on Hiro’s head captured POV shots and there was another one placed inside a crack in the Arch that would get a nice top down view. 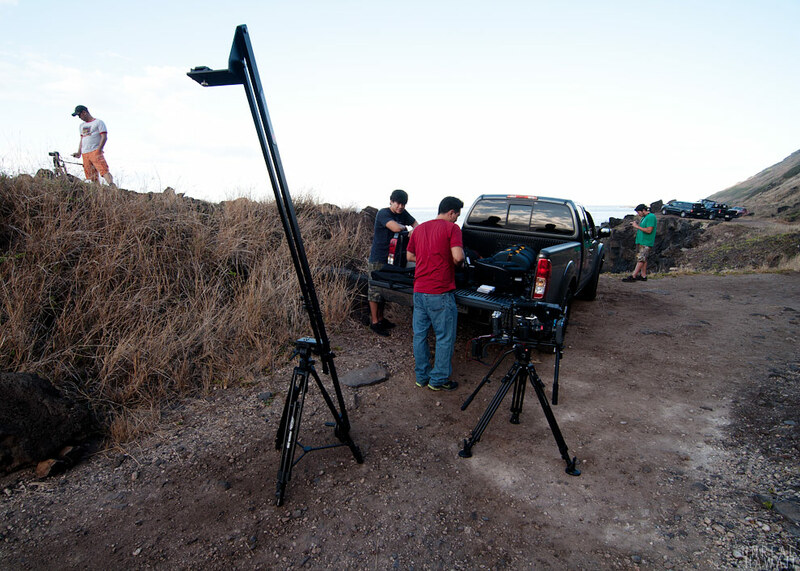 This jib allowed the Berad Studio crew to follow the climbers up the route and to get nice sweeping pans. 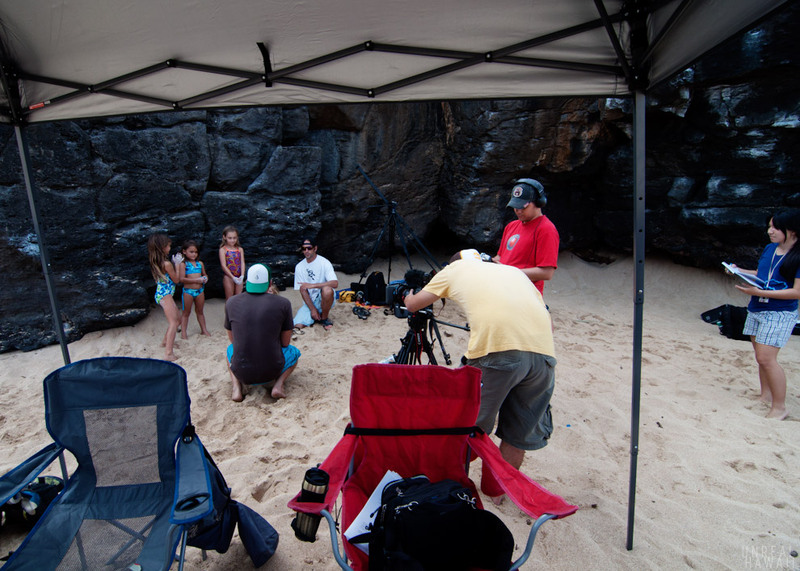 The jib was rented from the good folks at Hawaii Photo Rental. 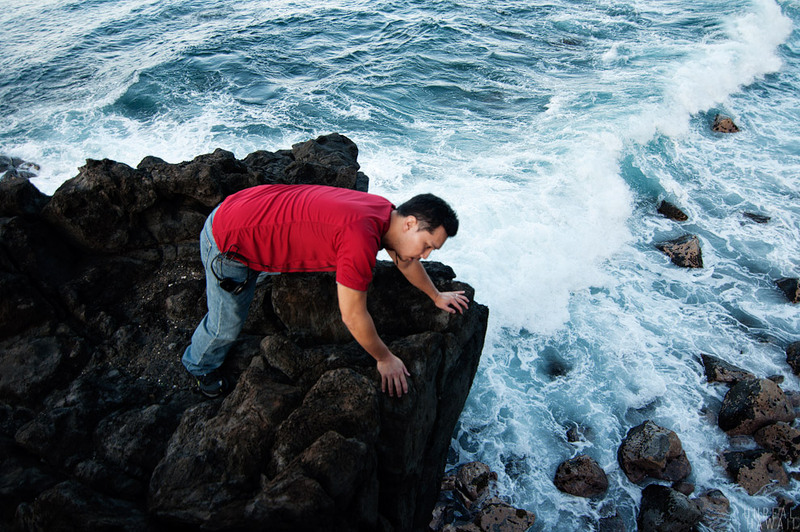 One big issue we had to deal with during this shoot was the swell. There was a bump in the Westside surf on this day and we got splashed on here and there. And, there was a constant mist in the air. At the end of the shoot it started to rain and Brad had to operate the camera from under a towel. We were lucky to have a crew of friends with us to help carry gear back up to the trucks. 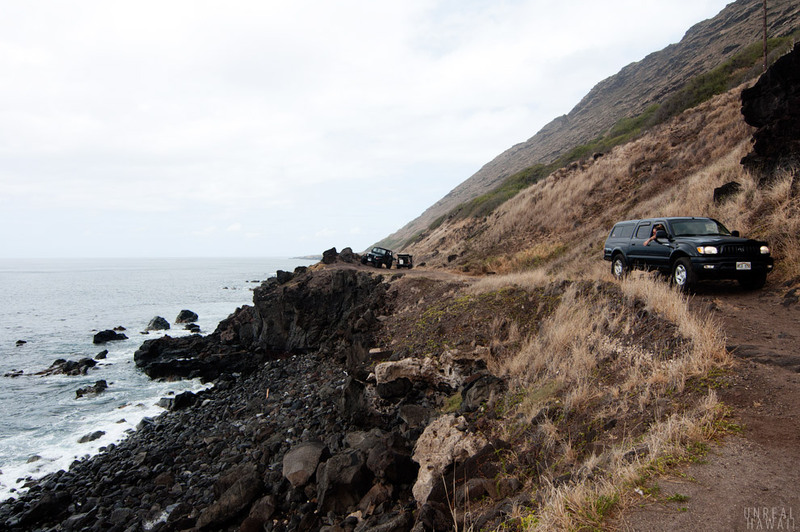 4×4 trucks are required to get out to the Arch and with thousands of dollars of camera gear in the trucks, driving to and from our shoot location was slow going. 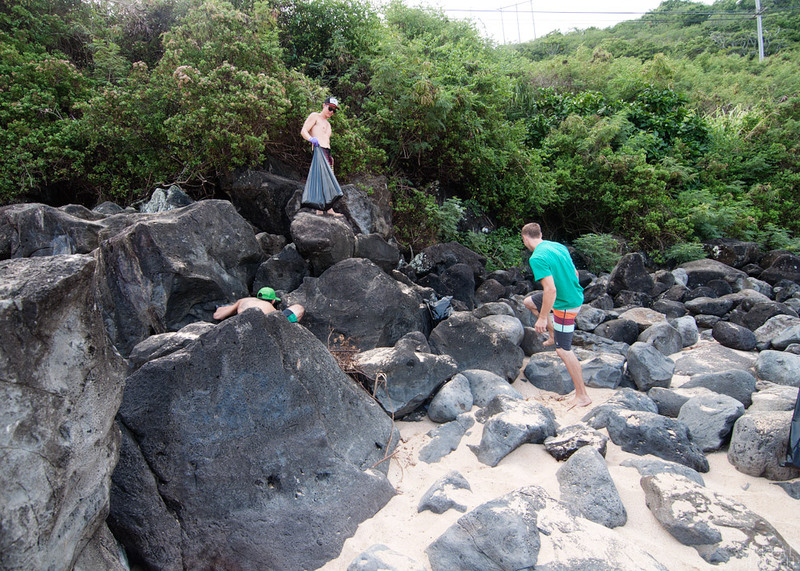 Our third shoot involved documenting a Volcanic Rock Gym beach clean up. This would be the third or fourth clean up organized by VRG. With the climbing community growing in Hawaii, the turn out was really great. We had four tents and tons of food. 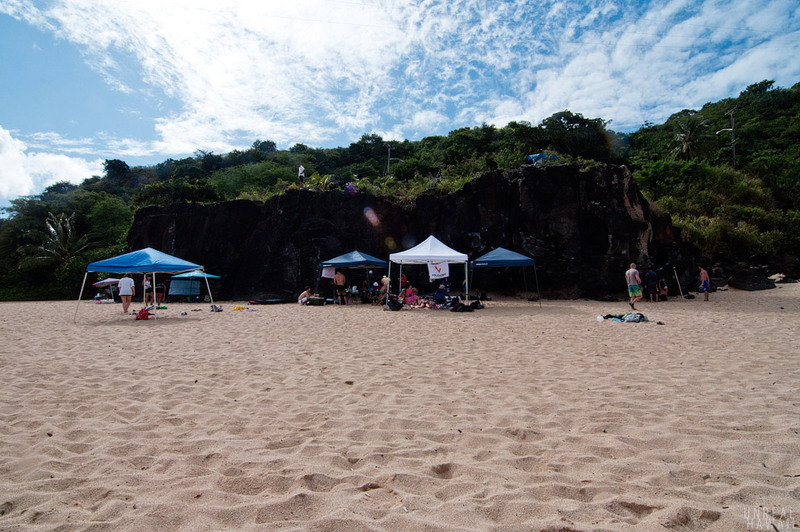 The beach was surprisingly in pretty good shape on this day, but we still ended up pulling a lot of trash out of the rocks and around the park. Here, we’re interviewing Ken and his kids. 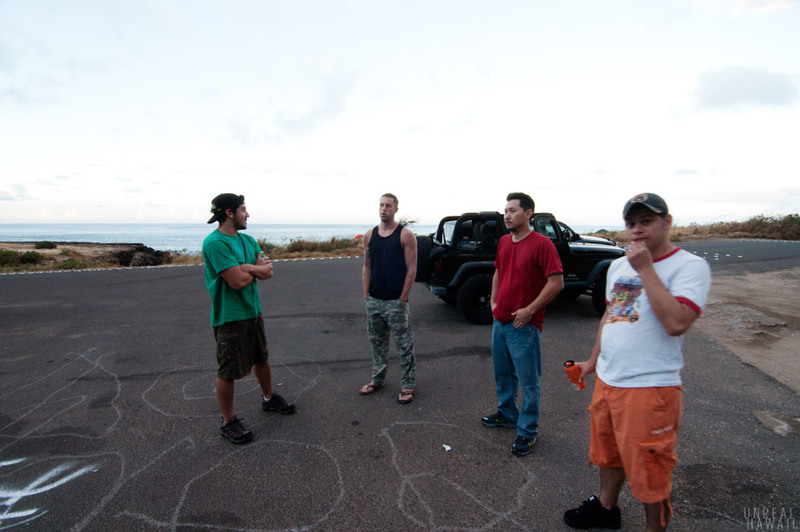 Our fourth shoot was at my friend Cliff’s house in Kaneohe. I know Cliff from VRG and I wanted to share his story about the climbing gym he has under his house called The Monkey Cave. Cliff somehow was able to get his wife to let him build a gym under their house. His climbing buddy Kyle, then helped him build it. It took them a year and they did almost all the work themselves. 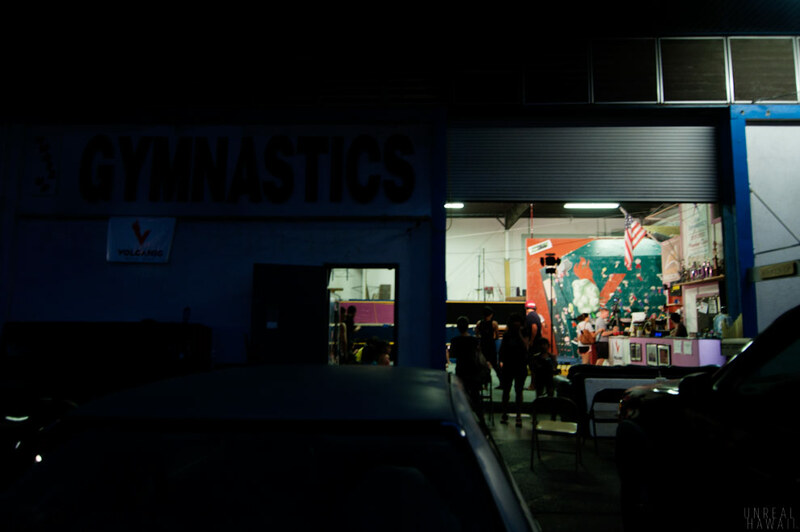 Our final location was at Volcanic Rock Gym where we did several interviews. Then we had to edit it all together. Before moving back home to Hawaii, Brad worked as a video editor for 6 years in LA at an award winning production shop called Motion Theory. His experience shows in how fast he works. I got to sit in on a couple editing sessions and it was fascinating to watch how a story comes together in the editing processes. I still have no idea how he keeps track of all the video footage he shot. Especially when there were several cameras. Editing is a lot more complicated than I had imagined. You have to first piece the entire story together, which take a lot of work. Then you have to select, purchase and sync up the music. Then you have to color correct every snippet of video in the edit. And finally you have to add in your titles, captions and graphics. It takes a ton of skill. 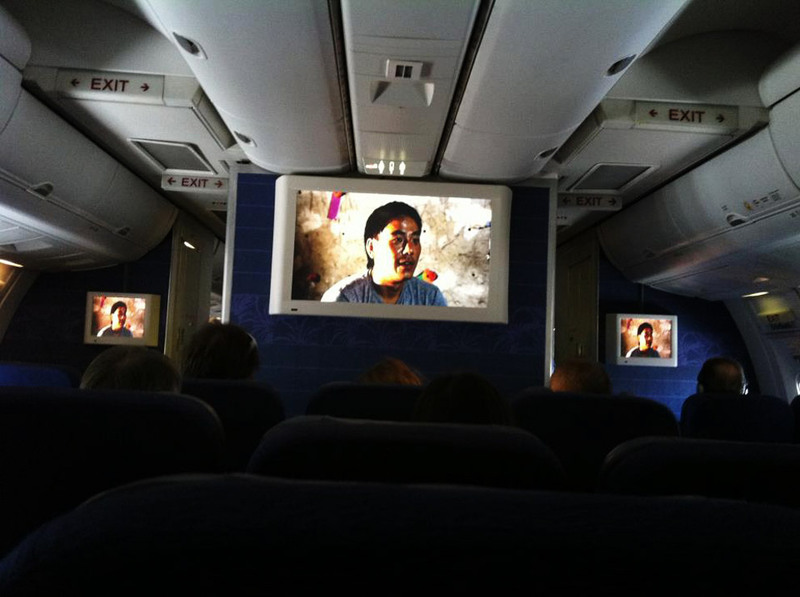 All that labor we put into this video project was worth it though when we started hearing that people were seeing the video on Hawaiian Airlines flights. And one night I got a text message with this photo in it. When I fly to the mainland (typically LA) I almost always fly Hawaiian. The seats are bigger, the service is way better than other airlines and the prices are typically cheaper too. And, no I’m not getting paid to write that. It’s just a great airline. So, I was definitely proud to be part of this project. I haven’t traveled off the island for a couple months, so I have yet to see the video on a flight myself, but I hope people are enjoying it. 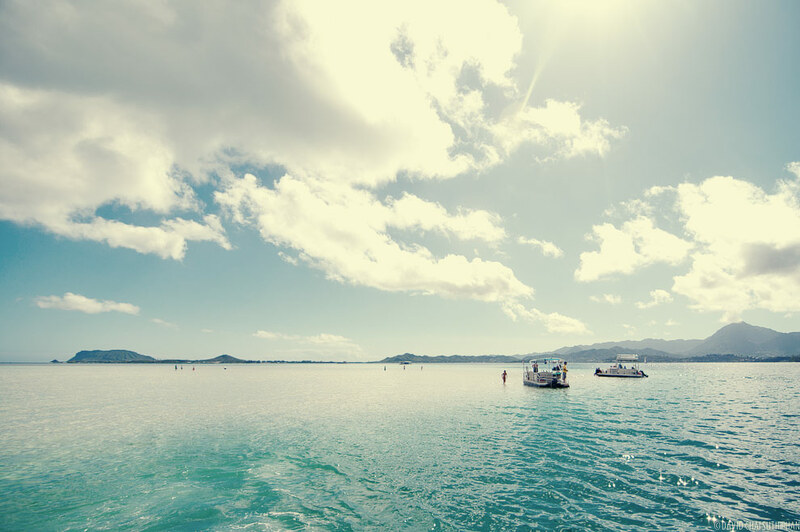 You can watch the video on the Hawaiian Skies blog. Learn more about Berad Studio at BeradStudio.com. 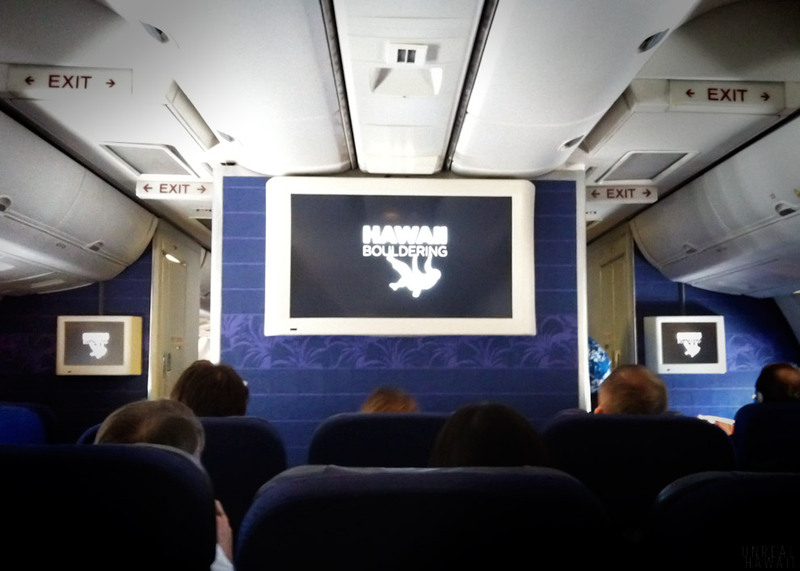 Learn about Hawaiian Skies, the in-flight video magazine of Hawaiian Airlines. 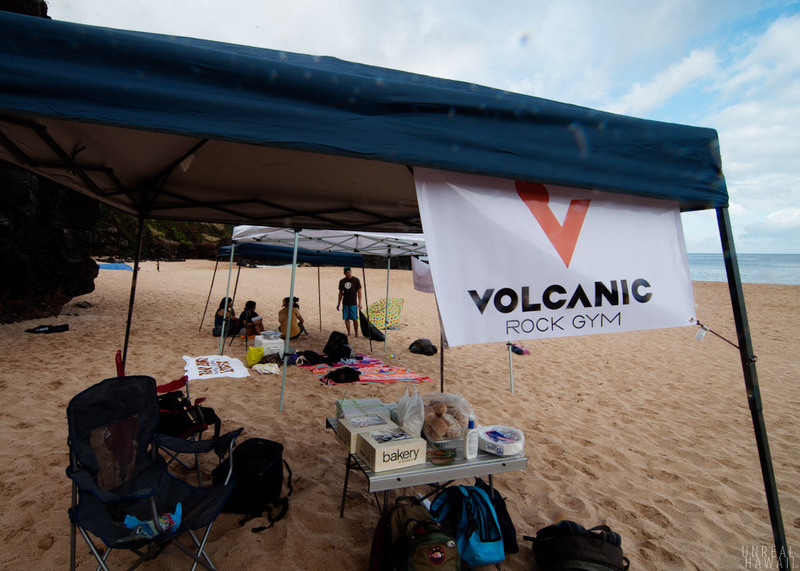 If you want to give bouldering a shot, visit Volcanic Rock Gym sometime or check out the rock at Waimea.